A man, presumably the speaker, stands on what might be a platform or a stage. He stands behind a lectern. A microphone mounted on a microphone stand is nearby. An audience is in attendance. The speaker holds the microphone stand with his left hand. Speaker: The Flashback virus proves that Macs get viruses just as often as Windows. The speaker is now a little closer to the audience, and to the side of the lectern, and away from the microphone. The speaker gesticulates with both arms spread outwards and upwards. Speaker: We predicted this day decades ago. You need to buy our Mac antivirus software today. Presumptively male audience member: Would it have blocked Flashback? The speaker is now behind the lectern with arms lowered. Speaker: That’s really not the point, sir. I don’t know if I get it. 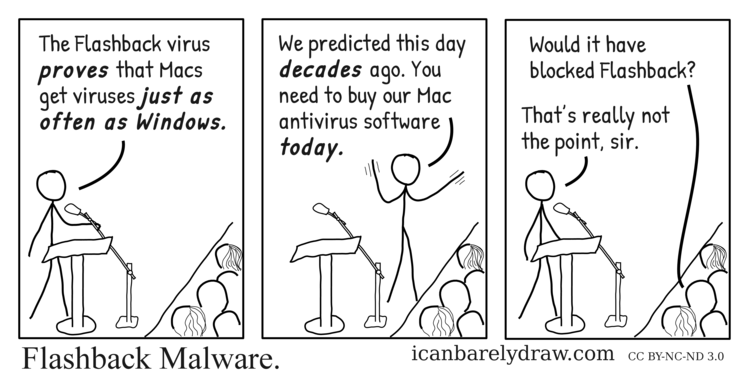 The point of a Mac antivirus software is not to block viruses? Then is it just to cash on people? Err..?